World No. 1 Tiger Woods has won the Masters Tournament four times, the last occasion being in 2005. (CNN) -- Tiger Woods' popularity has plummeted -- but most Americans will still be rooting for him to win when he tees up at the Masters tournament in April, a new national poll suggests. Nearly 60 percent of those who answered a CNN/Opinion Research Corporation survey said they wanted the embattled golfer to win the event at Georgia's Augusta National course, which would be his fifth victory there. Twenty percent said they did not want him to win and another 20 percent said they did not care. The Masters will be Woods' first time back in professional golf since his November car crash outside his home and the media frenzy about his extramarital affairs. 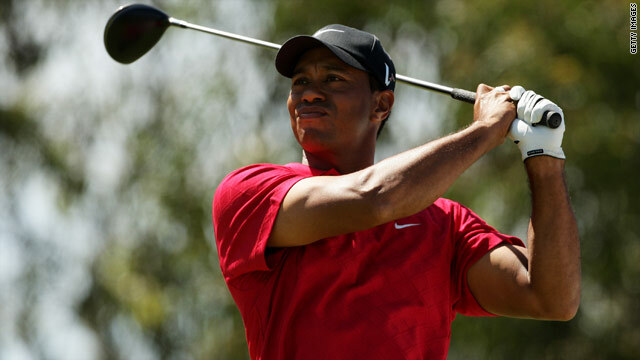 And even though Woods has taken a hiatus from playing, 52 percent of those polled said they think Woods will win the Masters, the first of the golf season's four major tournaments which runs from April 5-11. An overwhelming majority of those polled, 75 percent, thought it was appropriate for Woods to return at the Masters and that he did not have to wait longer. But still, a majority of those polled, 45 percent, had an unfavorable view of Woods. Forty-three percent had a favorable view. These numbers are in striking contrast to 2005 when about 85 percent of those polled had a favorable view of Woods. Woods' public woes began with an early-morning crash November 27 outside his Orlando-area home, when he suffered minor injuries after striking a fire hydrant and a tree with his Cadillac SUV. Woods was not required to talk to police about the wreck and declined to talk with investigators on several occasions. Eventually, he was cited for careless driving. The accident occurred days after the tabloid National Enquirer named Woods as having an affair with a New York nightclub hostess. The woman has denied the allegation, but several others have come forward to claim that they had sexual relationships with Woods, who has two children with his wife, former model Elin Nordegren. In a carefully-managed March statement, delivered to a small, hand-picked crowd, Woods said he was in inpatient therapy for 45 days from the end of December to early February for "issues," which he did not explain. The controversy prompted several major sponsors to suspend or drop their relationships with Woods, who also apologized to his business partners for his behavior.